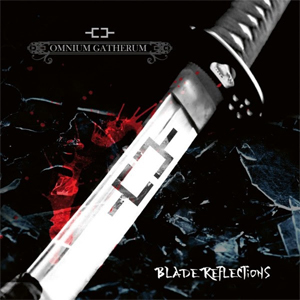 OMNIUM GATHERUM Stream New Single, "Blade Reflections"
From A New Split 7"
OMNIUM GATHERUM have just released their brand new single “Blade Reflections”. It is now available on all streaming and download platforms and will also be featured on a limited Edition OMNIUM GATHERUM/SKALMOLD split 7-inch, which will be available on the upcoming "Arctic Circle Alliance” European Tour (see below for all dates). You can watch the lyric video for “Blade Reflections” streaming below. Preorder a copy of the 7-inch at OMNIUM GATHERUM’s web store HERE. Singer Jukka Pelkonen comments, "In the light of recent events we wanted to voice our opinion about the tragedy of suicide. This is a subject that may concern anyone at some point. "Blade Reflections" is a statement against suicide and an encouragement to all of those who dwell in the depths of self-annihilation. Having been there myself too, I know how devastating it can be. There is nothing more precious than this life itself and it is worth seeing through. Though, we do not condemn those who choose to go, rather we want to stand by with all the rest, all of us, who are staying." Guitarist Markus Vanhala adds, ""Blade Reflections" is a lil’ older song that didn’t entirely fit to our previous album, so here it is - as a single format standalone anthem! The song was produced in a kind of swansong recording session with our former long-time drummer Jarmo Pikka. So we still keep Tuomo Latvalas' upcoming beats and styles as mystery for you til’ the next album, the Century Media OG debut, which we're soon about to start recording. Before that, enjoy "Blade Reflections" and come to see us on autumnal European stages in October/November during our ?Arctic Circle Alliance' co-headline tour with Icelanders of SKALMOLD and Finnish fellows STAM1NA opening all the evenings!"